eNVie Parfum is a perfume studio that falls under the umbrella of the House of NA, which also houses Nocturne Alchemy. eNVie perfumer, Emerson Hart, orchestrates symphonies of scent and even refers to his role as a composer. The hallmark of eNVie is the use of high quality ingredients utilizing classical perfumery with an eye to ethics and passion. In my opinion this is a high end niche perfume house with a focus on perfume oils. This house has a signature scent that is the muse and inspiration for many of its creations: Saphir. Prices for the 25 ml oils run from $225 to $300 each, which is reflective of the rarity of extracts used. I am not a stranger to purchasing expensive perfumes, but certainly not blindly (well, usually). Samples of these scents can be obtained through Ajevie but I like eNVie's travel set option so that is the route I took. eNVie Parfum celebrated their first anniversary in May with a 15% off coupon. My fancy had been tickled by the double 5 ml travel set for some time now, so I knew I would splurge for one once the sale was teased on their Facebook page. The Ensemble de Voyageur Deux set includes two 5ml bottles from most of the house's fragrances, except the exclusif line, for $90.00. 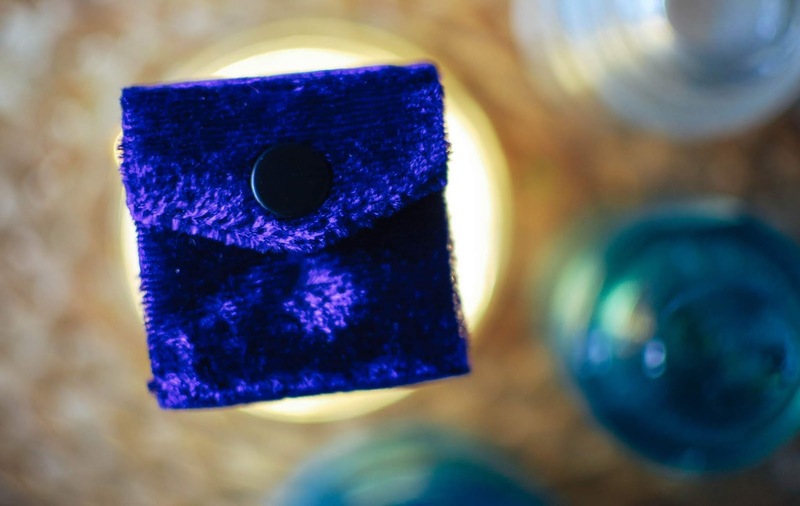 The choice of a blue or red velvet box can be made. 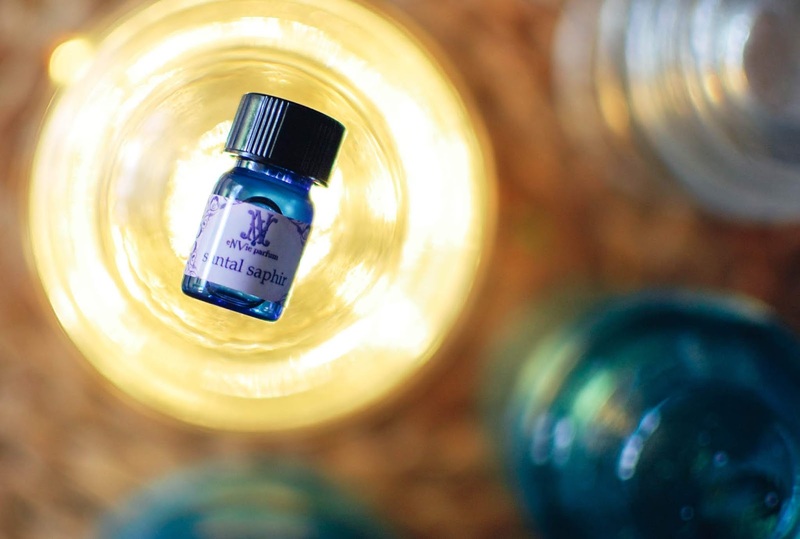 Bleu Saphir- Notes: Blue chamomile absolute, labdanum, Siam benzoin, Blue Sumian lavender, coral wood, blue cypress, blue yarrow absolute, blue tansy infused in blue amber and Saphir. I have a bit of a love affair with anything "blue" from The House of NA. I find it to have nuances of ethereal sweetness and a dreaminess. If a lunar resin was discovered and burned in some otherworld altar, moon incense, that is what the "blue" reminds me of. Freshly applied to the flesh, silver hued lavender and syrupy chamomile and tansy float up on a softly smoky cloud of vanilla. Gauzy, sky blue. The herbal top notes drift deeper into candied indigo labdanum and crystallized vanilla amber. Satiny, cobalt haze. 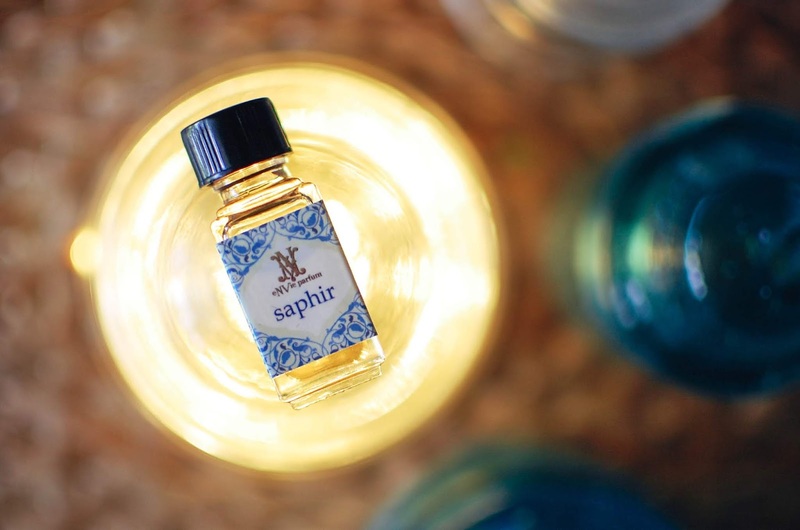 Bleu Saphir settles down its twilight life by smelling of Saphir. While the sweet resins and vanilla have a strong presence they manage to wear light as dandelion wishes. The Bleu Saphir lingers like an aura around the skin, with a personal sillage that must be approached rather than approaching others. Blue heaven. 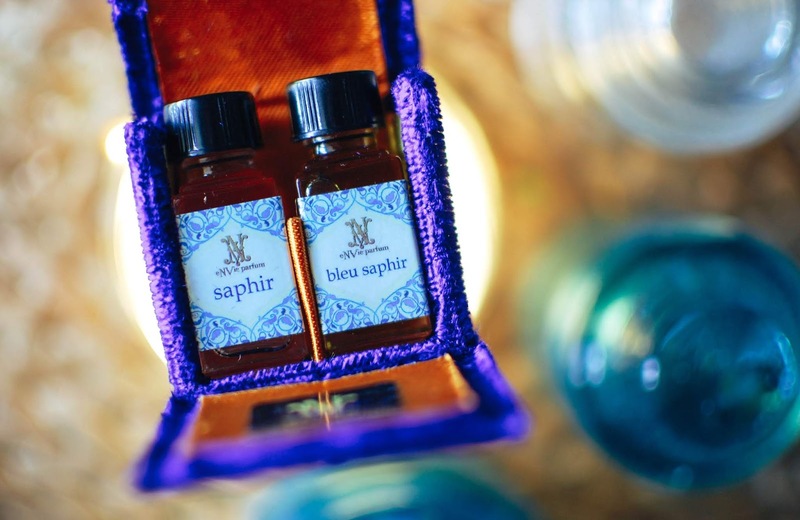 Saphir- Notes: Egyptian musk and musk resin purified into natural notes of blue balsamic amber, sweet papyrus oil from Cairo and Siam benzoin that hints naturally of occurring warm and pure vanillin. This is the muse. This is the house signature scent that I knew I needed to experience. 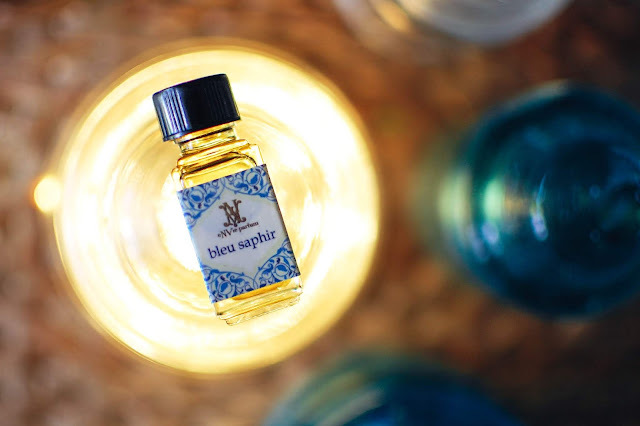 If Bleu Saphir focuses more on the herbs initially then weaves into a sapphire nimbus before becoming Saphir itself, then the original Saphir is its creamier more tangible companion. Sugared vanilla and balsamic amber open up this beauty, a slender touch of spice and woods. Saphir rolls around on the skin like resinous butter. Smooth, well blended euphoria. When I dream of a perfect vanilla, this is what it would smell like. The benzoin and amber, musk and papyrus all merge into this beatific vanilla accord. Wood hued, amber laden, creamy vanilla deliciousness. I will be using this all. Every last drop. This scent absolutely can be worn on its own, but it can also be layered with other eNVie fragrances. I will admit I was very much pleasantly shocked to see such a generous sample included with the order. It was almost like mind reading too when I saw it was Santal. Sandalwood is my weakness. Santal Saphir- Notes: Sweet Australian sandalwood, heartwood, Mysore sandalwood infused into Alexandrian sandalwood with fine drops of Indian oud, palo santo infused sandalwood and Saphir. Creamy luxe sandalwood, sanded smooth but just with that soft catch of nap left in the wood that makes it feel as if it is caressing you back when you run your hands over it. Sandalwood incense and vanilla resin. The ultimate vanilla sandalwood scent. It is luxurious and refined, raw in its power and beauty. I am utterly smitten. Prudence would say that I graduate to the 5ml and bring Patchouli Blanc along for the ride but my heart years for the big bottle already. Saphir and Santal Saphir? A girl can dream. What high end perfume have you made lovelorn coos of adoration at? Did you ever capture your elusive fragrance? I am really impressed with these perfumes and happy I took the plunge. I will be back for sure. Thank you for the reference. I love lighthouses. <3 I do know that chamomile yields a brilliant blue when distilled/processed. But for some reason, to me, it really does smell "blue" too. I love the smell of blue. LOL! I'm so very new to NAVA, so I'm very glad to have read this recent post. (I go back and read your perfume archives depending on what I'm looking into, but often forget all the details or vendors all become jumbled in my scattered mama brain). Anyway, so I've kinda forgotten enVie and what that was exactly. lol Now, I got it!! Such wonderful sounding fragrances you've reviewed here. I gotta look into sandalwoods.. I don't have enough sandalwood heavy perfumes. Sandalwood is one of my weaknesses. I simply adore it. I need to go back and update my perfume list so I can make sure I am staying on top of the scents I have reviewed. Sometimes I will just browse that page and my eyes will pop thinking of all the perfumes I have smelled and those are only the ones I have reviewed. I have so many that I have not. But it is fun. My nose likes it. Ohh yes!! You are so lucky to have smelled so many. How delightful. YES!!! My nose vomit would certainly be someone else's holy grail perfume. Hmmmm.... I very rarely have had a complete grossed out reaction to any perfume I have tried. I have never had a scrubber. I think the closest would be the T.S. Goodfellows scents that Arcana had. In the vial they all smelled of wretched curdled vinegar to me. I don't know now if I even put any on... which is a horrible faux pas in the perfume oil world... ALWAYS put it on as it does change. Hm. Not sure I would seek another one out though to try it. I will say Olympic Orchids Mardi Gras stretched me a bit. It is very gamey.